Dupuytren’s contracture (DC) might have a higher incidence in patients with epilepsy . DC’s association with the duration of antiepileptic drug (AED) therapy and the notion that it is a probable sequela to long-term AED use has been hypothesized to account for this, but a definitive causal relationship has not been established [2,3]. However, the association of DC with patients with epilepsy and the duration of AED therapy is easily overlooked in a clinical setting if the physician is not prepared to look for it, and the presence of DC might lead to unnecessary investigations and management. We report a case of the subacute onset of DC after long-term AED therapy. A physically well-developed 38-year-old 71-kg man began to have intractable generalized tonic-clonic seizures at age 20 after an episode of encephalitis. His cognitive recovery was fair. His personal and family histories were unremarkable. On his first visit to our clinic, his neurological examination was essentially normal. His habitual seizure semiology was an initial 5-10 seconds of tinnitus as an aura, followed by palpitation and then posterior head numbness, or right-thigh numbness, or both. Soon he developed upward gazing, saliva drooling, and generalized tonicclonic seizures. Most attacks were during the day while he was awake. He had been prescribed numerous AEDs-phenytoin, carbamazepine, valproic acid, topiramate, and pregabalin-and remained on phenobarbital (330 mg/day),levetiracetam (3000 mg/day), and oxcarbazepine (1200 mg/day) for years. His average seizure frequency was 5 times per month despite AED therapy. The phenobarbital was then titrated to 360 mg/day. The patient had a subacute onset of discomfort over his finger joints 20 days after the titration. Because of his progressive difficulty in stretching and flexing his fingers, he visited our Orthopedics clinic. The proximal interphalangeal (PIP) joints of his bilateral long, ring, and little fingers were stiff, and multiple small joints were swollen and painful (Figure 1). The patient was referred to a plastic surgeon for further management. X-rays of his fingers showed that the bony structures of his hands were grossly intact but that the joint spaces of his PIP and distal interphalangeal (DIP) joints had slightly decreased (Figure 2A, 2B). Boutonnière deformity was diagnosed by the radiologist. The patient was then referred to the Rheumatology clinic. A series of biochemistry tests-erythrocyte sedimentation rate, chronic reactive protein, and anti-nuclear antibody-were done, and all were within normal limits. One rheumatologist suspected tenosynovitis, but another thought it was DC. The patient refused a local steroid injection; thus, he was referred to a plastic surgeon who said that surgery was not indicated. Finally, he was referred to a physiatrist and treated with hand splints. After a comprehensive review of his medical history and a high serum level of phenobarbital (72 μg/ mL), we arrived at a diagnosis of Boutonnière deformity in DC, based on DC’s potential association with long-term antiepileptic drug therapy, especially phenobarbital. After the patient’s phenobarbital dose was reduced to his baseline level (300 mg/day) with the serum level dropped to 54 μg/mL, he felt that the difficulty of moving his fingers and the discomfort in his fingers was attenuated. He felt no significant improvement, however. Figure 1: Stiffness and contracture in the proximal interphalangeal (PIP) joint of the patient’s bilateral long, ring, and little fingers, and a mildly thickened palmar fascia. 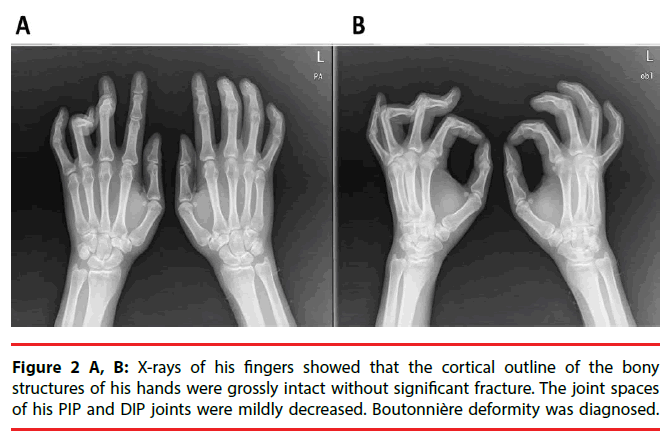 Figure 2 A,B: X-rays of his fingers showed that the cortical outline of the bony structures of his hands were grossly intact without significant fracture. The joint spaces of his PIP and DIP joints were mildly decreased. Boutonnière deformity was diagnosed. It is not uncommon to encounter connective tissue change with AED therapy, including gingival hyperplasia in phenytoin therapy. After we reviewed the patient’s medication history, we found that he had been taking phenobarbital for more than 10 years, longer than he had been taking any other AED. The literature suggests that phenobarbital might be significantly associated with connective tissue disorders [3,4]. In our case, the contracture developed after we titrated the patient’s already high baseline dose of phenobarbital (300 mg/day) to 360 mg/day (120 mg tid, close to the maximum dose of 400 mg/day), which probably explains the cause of his subacute onset. Moreover, the Naranjo Score of 6 in this case , which indicates a probable adverse drug reaction, determines the likelihood of DC is due to phenobarbital. Furthermore, neither of the co-medications has been reported to intensify this phenobarbital-related toxicity. We hypothesize that higher doses exacerbate already activated connective tissue growth under long-term phenobarbital therapy, which causes greater imbalance in the extensor hood on the damaged tendon, and leads to a subacute onset of symptoms, as in our case. However, what specific duration of use and dose of phenobarbital typically leads to DC is currently unknown. The dosage thresholds might vary depending upon the individual patient. The incidence of DC in the general population is estimated to be 16%, and whether the incidence in patients with epilepsy is higher is controversial . It was also reported that patients > 50 years old, and adults of northern European descent have a higher incidence of DC [1,6]. In addition to AED therapy, other common risk factors include a family history of DC, smoking, diabetes, drinking alcoholic beverages, tuberculosis, and liver failure.3 Although our case might suggest a potential dose-dependent relationship, whether a higher dose, as opposed to a low-to-moderate dose, will lead to an earlier occurrence and to a more acute onset of DC, as in our patient, is currently unknown. It is easy to overlook DC, especially if it develops incidentally. Because our patient had a relatively subacute onset, he had to alert his physicians about it. It is common to encounter in patients with incidental DC an incorrect diagnosis, e.g., osteoarthritis, rheumatic arthritis, and tenosynovitis, all of which will lead to numerous unnecessary studies and treatments. Thus, we conclude that when physicians treat patients who have been on long-term AED therapy, especially phenobarbital, they should be aware of the possibility of DC. This case also showed that DC can have a subacute onset when a patient is given a high dose of phenobarbital. The work was supported in part by a grant from Chi-Mei Medical Center (CMNCKU10515) and from Ministry of Science and Technology, R.O.C. (105-2314-B-006-013). Arafa M, Noble J, Royle SG, et al.Dupuytren’s and epilepsy revisited. J. Hand. Surg. Br17(2), 221-224 (1992). Critchley EM, Vakil SD, Hayward HW, et al.Dupuytren’s disease in epilepsy: result of prolonged administration of anticonvulsants. J. Neurol. Neurosurg. Psychiatry39(5), 498-503 (1976). Geoghegan JM, Forbes J, Clark DI, et al.Dupuytren’s disease risk factors. J. Hand. Surg. Br29(5), 423-426 (2004). Mattson RH, Cramer JA, McCutchen CB. Barbiturate-related connective tissue disorders. Arch. Intern. Med 149(4), 911-914 (1989). Naranjo CA, Busto U, Sellers EM, et al.A method for estimating the probability of adverse drug reactions.Clin. Pharmacol. Ther30(2), 239-245 (1981). Strzelczyk A, Vogt H, Hamer HM, et al.Continuousphenobarbitaltreatmentleadstorecurrentplantarfibromatosis. Epilepsia 49(11), 1965-1968 (2008).